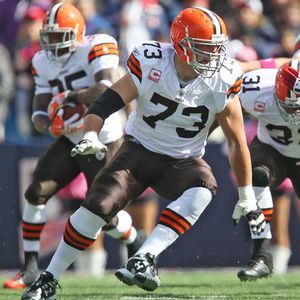 Josh Cribbs, Peyton Hillis and Joe Haden may be the heart of the Browns, but Joe Thomas is clearly the hardworking soul of the team. So it was no surprise that the team and the Pro Bowl left tackle have agreed to a seven-year contract extension worth $84 million, including $44 million guaranteed. And you don’t have to read too hard between the lines to realize that the changes that team president Mike Holmgren and general manager Tom Heckert have made since arriving in town played a big role in Thomas staying with the team. “We’re really building something special with Tom Heckert and Mike Holmgren and I think this program is headed in the right direction,” Thomas told The Plain Dealer. “It was really important for me to make this a real long-term deal so that I can finish my career here. It’s nice that the Browns finally have players of their own that we want the team to resign to these kinds of deals. In addition to Thomas, it’s pretty easy to see deals like this down the road for Haden and Alex Mack. And (dare we say it? ), if things go well, Colt McCoy. Add a few more players to that core group and the Browns might actually make Thomas’ wish come true. Shurmur’s philosophy was on display Friday night against Detroit as quarterback Colt McCoy was 5-of-6 for 55 yards and three touchdowns on plays from inside the Lions’ 23-yard-line. The good part is the Browns can run the ball; if they can add even an average passing attack to their offense it will really help the team take another step in the right direction. Finally, Real Clear Sports ranked the 10 best college quarterbacks to switch positions in the NFL, and it’s no surprise that two Kent State players are on the list – Julian Edelman and Cribbs. *Sarcasm font is activated at 30 percent.